Beryl Bainbridge was expelled from the Merchant Taylors' Girls' School because she was in posession of a 'dirty rhyme' written by someone else. She continued her education elsewhere and after she left school she fell in love iwth a prisoner of war from Germany. He was sent back to Germany and they corresponded for several years and tried in vain to obtain permission for him to return to England so that they could marry. In 1953 they ended their relationship. She married the artist Austin Davies in 1954. They had two children but divorced soon afterwards. In 1958 she tried to kill herself but she survived. She worked as an actress and in 1961 she appeared in an episode of Coronation Street. In 1965 she had a daughter by the novelist Alan Sharp, the actress Rudi Davies. She had started writing but her first novel "Harriet Said..." was refused and not published until 1972. She managed to have other novels published in 1967 and 1968. In 1977 she won the Whitbread Pize for "Injury Time". Many more novels followed and "An Awfully Big Adventure" (1989) was turned into a movie. During the 1990s she wrote historical fiction. In 1998 she won the James Tait Black Memorial Prize for "Master Georgie". Her last novel was "According to Queeney". She became a Dame Commander of the Order of the British Empire in 2000. At the time of her death of cancer she worked on the novel "The Girl in the Polka Dot Dress". It was edited for publication by Brendan King. 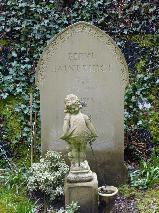 The grave of Beryl Bainbridge at Highgate Cemetery West, London.